The two outlets at the top and bottom ensure a comfortable air conditioning. You can choose the best air outlet from the following patterns. 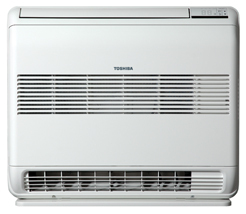 The warm air from the bottom is a Toshiba original feature and it flows air to the floor directly and spreads along the floor.